Apes were invented because politicians were needed. Aphorism as given by the fictional character Dezhnev Senior, in Fantastic Voyage II: Destination Brain (1987), 55. If some race of quadrumanous animals, especially one of the most perfect of them, were to lose, by force of circumstances or some other cause, the habit of climbing trees and grasping the branches with its feet in the same way as with its hands, in order to hold on to them; and if the individuals of this race were forced for a series of generations to use their feet only for walking, and to give up using their hands like feet; there is no doubt, according to the observations detailed in the preceding chapter, that these quadrumanous animals would at length be transformed into bimanous, and that the thumbs on their feet would cease to be separated from the other digits, when they only used their feet for walking. Philosophie Zoologique (1809), Vol. 1, 349, trans. Hugh Elliot (1914), 170. 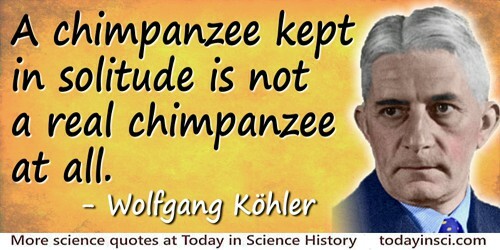 The Mentality of Apes (1925), 293. The Dictionary of Accepted Ideas (1881), trans. Jaques Barzun (1968), 59. Man alone amongst the animals speaks and has gestures and expression which we call rational, because he alone has reason in him. And if anyone should say in contradiction that certain birds talk, as seems to be the case with some, especially the magpie and the parrot, and that certain beasts have expression or gestures, as the ape and some others seem to have, I answer that it is not true that they speak, nor that they have gestures, because they have no reason, from which these things need proceed; nor do they purpose to signify anything by them, but they merely reproduce what they see and hear. In 'The Third Treatise', The Convivio of Dante Alighieri (1903), Chap. 7, 175. This footnoted: Compare De Vulgari Eloquentia, Book 1, Chap 2: 43-65. The Man Who Could Work Miracles: a film by H.G. Wells based on the short story (1936), 105-106. Quoted in Carl Sagan, Broca’s Brain (1979, 1986), 3.